Thank you Madam Senator Pro-Tempore for the honor to be here this morning. 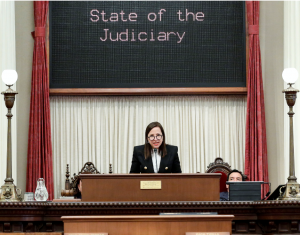 I’m grateful for the opportunity to add my voice to the chorus of those who today will recognize the importance of a just, fair, efficient, accessible and above all independent judiciary to a strong and healthy democracy. When I served overseas representing our country I often spoke about American democracy and what has allowed it to endure for over two centuries – the longest, and strongest democracy in history. And I found myself repeating a common refrain – democracy is always a work in progress, for our country and for any country. An enduring democracy must possess the ability to adapt and modernize, to be nimble and responsive to changing times while adhering to time-tested principles. Finding the balance requires hard work – sometimes messy, sometimes full of conflict – but always in the interest of building a better, stronger system for the next generation.